Her tree-sit to save the ancient redwood tree, Luna, made her a legend. Her spirited activism continues to inspire as she tirelessly works to further her vision of a world in which the magic of nature is respected and perpetuated. Julia Butterfly Hill graced the Wild & Scenic Environmental Film Festival in Nevada City with a heartfelt challenge for attendees: to find their own path of activism. Butterfly Hill introduced the film Snowbowl Effect and facilitated a youth workshop that drew over 400 people to City Hall. Pamela Biery spent some time discussing Butterfly Hill’s work and experiences, along with future plans, between events. 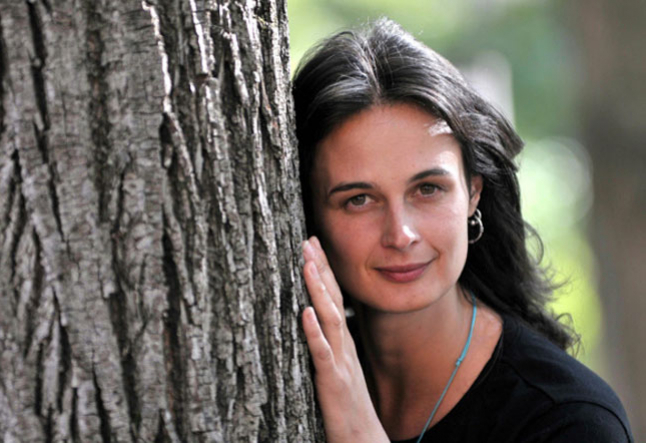 Since touching ground from her tree-sit seventeen years ago, Butterfly Hill penned the best-selling book Legacy of Luna and created the Circle of Life Foundation to further environmental awareness and activism. Now Butterfly is busy preparing for the movie that will tell Luna’s story, her way, on Hollywood’s first green set. Julia Butterfly Hill - The beauty in all of the attention that came at me is that I was under a microscope, and it often wasn’t pretty.... You know that I didn’t go into that tree thinking that I was going to go on this self-discovery process, I didn’t think about attention coming to me.... I just went up into the tree because it was all I knew how to do to help and then this whole other thing got put on me. I had to put myself under the microscope because it was like, well, who am I? Not who does everyone else want me to be—what do I need to let go of? How do I just take out all of the stuff that is in the way of me being my true self? The austerity of the tree-sit made me uncover parts of myself just because of the physical requirements—the tree-sit itself made me get rid of the actual stuff—but I had to get rid of all the metaphorical stuff as well. The hardest work for me has not been living in the tree; the hardest work has been putting myself on stage over and over again. By my nature, I’m the one who knows to go climb the tree to escape the limelight, so choosing to stay public since coming down has been a really clear, committed path. It is riskier for me to get on a stage than to live in a tree. I am not a super human...I am just an ordinary person committed to doing extraordinary things. This event I just did with all the young people, so many of the young people came up to me, including quite a few with tears in their eyes, saying ‘I’ve never seen anyone be so authentic with themselves and this just shows me that I actually have courage to be myself.” Can you imagine? We live in a world where it actually takes courage to be ourselves—what a concept! You would think being ourselves would be natural! But our world has gotten so disconnected and who we are in our lives is so disconnected, that it actually takes courage to be ourselves.... I want to be a mirror, and I know I’ve been an effective mirror if the response after an event is not only that people are inspired, but that they are inspired to be something, to do something. YT So would you say this is part of your own activism, showing people your commitment and understanding? Julia Butterfly Hill: Activism must go beyond the self-righteous to-do list. It has to become about what we do with our lives. It is asking to become the outward manifestation of what our heart wants to see in the world. Activism is about having a vision in our minds of what we would love our world to be and then giving that vision life through who we are being in every moment of every day. For instance, getting disposable anything out of our lives is a place to start. We use a paper cup with the plastic lid for our coffee. Where did the paper cup come from? Who lived in the place where the cup came from? Who works in the factory where those paper cups are made? What kind of chemicals were used in the factory, what is the affluent that is released out of those factories back into the water in the community where people work and live where those factories are located? That’s a paper cup. If we recognize that paper cup is the symbol of our lives, there is nothing in our life that doesn’t have a powerful thread attached to it. Every choice I make recognizing my own power and amazing thread of connection or disconnection can destroy or heal.